The N.H.S. is N.O.T. For Sale! Following a recent 38 Degree campaign to save our precious health service, I have requested a copy of the 260,000 signature petition to hand to my MP, Mrs Jackie Doyle-Price. If you go by Ms Doyle-Price’s questions in parliament, you would not be far wrong in the assumption that this MP – supposedly meant to be representing the broad interests of Thurrock as a whole – is a one-trick-pony with a bee in her bonnet about traffic and the Dartford crossing. Hardly riveting stuff when you consider the lack of public services in my remote area of Essex. Surely she could be finding something else to justify her holding that position of power and influence. I don’t expect much from a Tory, especially this one, as I have emailed her office on several occasions over various matters and gone ignored but with any luck an organised meeting to hand over a recognised and well publicised petition in public may cause Ms Doyle-Price to climb off her high-horse for long enough to spare a few moments to acknowledge the actual needs of her constituents, rather than what she thinks we ought to care about. When I have received my copy of the petition I will ring her office and arrange a meeting then follow the procedure. I will also be notifying my Local Labour Party office (of which I am a member) as I am certain that they will have a few questions to ask on the subject. I worry that the MP has shown little or no interest in this vital public service. As the situation in Egypt escalates with Mubarak’s pointed refusal to step down despite the clear and outspoken wishes of the Egyptians for democracy, one can’t help but worry about the fate of a people so clearly unused to real democracy and the responsibilities which that ensues. Just he history of the 20th century in Europe (and former British colonies such as Burma and India) is a clear example of the extreme caution required in political climates such as these. A nation cannot simply jump from totalitarian dictatorship (in the poor disguise of a presidency) to democracy overnight with nothing set up to replace Mubarak and his cronies, any more than Russia was even likely to have survived the sudden switch from communism. The Russians are no better off now under un-checked capitalism than they were under the previous regime and the same could be said for the Chinese. Western meddling in these affairs and simply deciding to step in and topple a regime is not helpful. A more recent example would probably be our military presence in Iraq and Afghanistan. We have become so complacent over our own good fortune that we forget the centuries of turmoil, blood and hard earned changes in attitude by our ancestors (not us) that has brought us what we think of as democracy, that we have become infected with the same form of blind chauvinism we accuse the out-of-touch wealthy few of: we feel so superior about our way of life that we become convinced that the rest of the world is green with envy and wants to be like ‘us’. Now to responsibilities. The Egyptian people have a responsibility to set up a proper system with multiple parties and proper well-considered manifestos before even considering a sudden change like this, lest they leave themselves open to becoming a twin to Iran. As yet it is unclear if they really have anything to put in Mubarak’s place We have a responsibility to learn from our past mistakes (and there are plenty of them) and leave the Egyptians to make decisions for themselves. If they ask for advice, then we may give it but only then (it’s always okay to ask). That is the only way they will ever achieve anything which is truly theirs. The Bastille is Falling Again. The revolts in Tunisia, Egypt and now, Yemen, however violent have to encourage us at least in some small way that the Arab world is in a state of flux which is having a domino effect. The authoritarian and arbitrary dictatorships in the Middle East were encouraged and capitulated by the west as and when they supported our economic plans. When they didn’t our governments responded by embarking on illegal wars which have cost the lives of thousands. However, there is a danger that, as in Iran, Mubarak could be replaced by someone far worse. Mr Hari asked if we should be concentrating on fixing the damage ‘The west’ has caused but I’m not sure at this stage it CAN be fixed. Owning up to our own unthinking capitulation would be a good start. UK taxes and resources were used to fund and supply Mubarak’s sick regime of fear. It is British made machine guns and grenade launchers that are aimed at pro-democracy demonstrators, while we sit quietly taking for granted the democracy we enjoy thanks to the courage and steely determination of our own ancestors. The US is not blameless either as their tear-gas was used to subdue people calling for basic human rights and the end to the reign of a vicious tyrant. We have been used to silently aid a murdering torturer while our governments tear Iraq and Afghanistan apart and pay false lip-service to bringing them democracy. Our foreign-policies SHOULD be a reflection of us as people. They SHOULD echo our moral principle and codes of decent humane behaviour. In the meantime our governments, who were elected to represent us, are failing to with dire consequences. They make hypocrites of us ALL and must be called to heel and made to account for their actions, both presently and retrospectively. It is for this reason that we need brave people like Julian Assange to provide us with the transparency that big government does not feel the need to do us the courtesy of supplying. They have repeatedly abused our trust but they are not shamefaced or remorseful for their actions in the least. They are angry with the person who has exposed their guilt and so try to discredit him. They pretend to be hurt that we will not now re-extend that lost trust; all actions of the skilled con-artist. It seems that even the US is ‘not above’ high handed tactics in order to enforce their will on the majority as the Military police have been holding another individual, Bradley Manning in solitary confinement without trial for several months. Transparency over our respective countries diplomatic conduct is essential if we even hope to regain our credibility with the rest of the world. We should know, and care very much, about what is done in our names as well as the consequences of those actions. To be a true democracy our governments must be made to represent us or be ousted immediately. We cannot continue to sit complacently by and let these people either rule our lives to suit the whims of big businesses or ruin the lives of others for the same reason and it is about time we ALL stood up and did something about it. It means using more than the ballot box to have your say because by that time it is too late and the policy has already been set and by voting for it you are giving it your stamp of approval. What must be done is the right of all free citizens of the UK and the US; JOIN a party,start your own, or become an independent and give people the alternative you think they deserve. The democratic process is a tool we all have the right to make a use of. 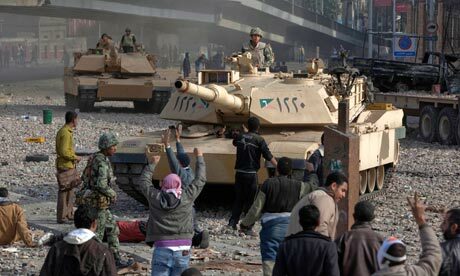 Refusing to get involved or vote achieves nothing but allowing the policies which supported the likes of Mubarak et. al. to continue unchecked and un-hindered. As it is, big business decides who we deal with and how and all that drives them is money; the rest is immaterial to them. They have taken it upon themselves to scrap our principles for us and by saying or doing nothing we have sent them our consent to do so. There are ‘reasons’ that our governments use in lack-lustre attempts to defend their conduct in foreign policy. The first is as Hari says, Oil. We have become reliant on it for fuel and the oil companies, like drug dealers, do not wish to lose demand for their product. Our ‘need’ for oil has outlasted its efficiency now that we have the means to produce, clean and renewable energy which threatens the income of those same companies. Even though Egypt has no oil, it does have pipelines and supply routes that the west rely on the use of. It is part of a chain that serves Western purposes and without support for the regime, our access to those lines and lucrative routes is also threatened. So what needs to come first? Principals! Integrity! Simple human decency and consideration of how our actions, conscious or otherwise, affect others. Integrity means that our principles are not brushed under the rug under the guise of ‘pragmatism’ whenever it suits us or others. It is when our principles are really tested that we find out what they are really worth. As consumers, we need to create a real consumer demand – on both sides of the Atlantic – for those clean energy sources and renewable fuels (even if its more expensive in the short-term) because it will take money out of the pockets of those companies who fund those regimes. THAT is how to rid ourselves of the need for ‘cheap’ oil (cheap for whom?) which is paid for with blood-money and oppression. We need to demand full and open access to information and a chain-of-custody style of accountability when shopping in order to exercise real purchasing power because we have the correct information. We must tell those companies what we want and need and stop allowing them to regulate us. They don’t care about our needs they care about their money. The second excuse is Israel. The so-called promised land of a people who have undergone centuries of religious persecution. That, however, does not excuse or justify their current occupation of Palestine, usurpation of agricultural land, destruction of property, deprivation of food and basic resources, and imprisonment of 1.5 million people within annexes of their own land. Punitive action is being taken for the ‘wrong result’ in a democratic election and Mubarak, not content with the suppression of his own people, is a knowing party to the horrific treatment of the people of Gaza. Israel’s behaviour is disgusting and their ‘peace process’ is a farce; a smoke screen of oppression and outright territorial theft. Mubarak receives $1.5 billion a year from the US government in return for blocking the passage of even sick people fleeing from Gaza, because their hospitals were collapsing. It is no wonder they grow to hate us considering what is being done to the people of Gaza and Palestine in our name and with our support. They have every right to be angry and we should be ashamed for what our respectively easy lives have allowed us to ignore for so long. The final, and even less credible excuse is that these dictators are suppressing a backlash against us. If they really think that those self-serving tyrants wouldn’t jump at the chance to shift blame from themselves to us, they are deluding themselves. Their foul penal systems of torture and indefinite incarceration has not stopped our ‘trusted’ officials sending prisoners to those very systems because their methods are illegal here or in the US as if it excuses the act. Torture by proxy is still torture and the person who allowed it is as guilty as the animal who carries it out. Tyrants only create more tyrants and when our money is used to harm and demoralise people we are also guilty of those crimes. The people of these countries have my full support and I applaud their courage to stand up for themselves in countries that do not grant the right to any form of protest and where the police are used as a fist to beat down dissent. In the mean time I shall be doing my bit here. We recently covered a story about the United States Army and how it is concerned with the spiritual well-being of their soldiers, and that if a soldier choose not to believe in the supernatural that the United States Army can consider you unfit to serve? The issue was brought to my attention by my friend, Sgt. Justin Griffith, Fort Bragg, NC., and concerned a mandatory survey called an SFT, which stands for “Soldier Fitness Tracker”. The purpose of this survey is to measure an individual soldier’s competency in several areas, including Spirituality. Sgt. Griffith is an atheist and a dedicated solider, and according to the interpretation of the survey results, he would be “unfit” to serve because he is a non-believer. There has been some question as to the whether or not Sgt. Griffith was a real person, or a pseudonym that was created for purposes of anonymity and if this is a real issue or just another instance of a “whiney atheist blowing his horn over nothing” We can assure you that Sgt. Griffith is a real a soldier in the United States Army, and that he is unashamedly atheist and that this is an issue that is not only real, but is being attended to by some very heavy hitters. Sgt. Justin Grffith has organized and is the founder of Rock Beyond Belief, which is an ambitious project that will be putting on a free festival consisting of secular speakers and musicians, both big name and small. They have the backing of many major secular and military foundations. Rock Beyond Belief is in the process of organizing a large-scale event that will be on the main post parade field on Fort Bragg, NC. The goal is the organzie similar events on many other military installations. The purpose of Sgt. Griffith’s efforts is to shed the negative connotations and debunk the myths associated with being a non-believer. We sincerely hope that this puts to bed any rumors that Sgt. Griffith is not a real person and urge you to visit the website of Rock Beyond Belief for more information about what they are all about, as well as a first-hand account of the SFT by Sgt. Justin Griffith, himself. If you are a Freethinker, please support Rock Beyond Belief by visiting their Facebook page and give them a “Like” to show the powers that be at Fort Bragg that there is a need, want and desire for this festival to take place. With respect to the issue at hand, the “Soldiers Fitness Tracker” and related training, we can assure that this is a real concern and it has come to the attion of, and is being addressed by, some very heavy hitters, including theMilitary Association of Atheists and Freethinkers (MAAF),Military Religious Freedom Foundation (MRFF), American Atheists (AA), the Freedom From Religion Foundation(FFRF), the Foundation Beyond Belief, the United Atheist Front (UAF), Americans United for the Separation of Church and State (AU), as well as high profile individuals such as Hement Mehta, Michael Weinstein (MRFF), Annie Laurie Gaylor (FFRF), David Silverman and Kathleen Johnson (AA), myself on behalf of the UAF, and several others. It has been agreed upon by the representatives of theMAAF, AA, AU, MRFF, FFRF, UAF as well as the other secular organizations that are involved in this issue, that this does not take away from the intention of the survey, the insinuation of the implied, nor the general lack of confidence that it engenders in our non-believing servicemen. Believing that your life is “connected to all humanity” and all the world holds a decidedly very supernatural connotation that is congruent with religious belief, whether that belief holds that the believer is“connected” through Christ, Muhammad, Akashic Record, Collective Conscious, etc. The fact that the introductory comments that says specifically that the spirituality questions are not “religious in nature” doesn’t change the fact that anything that connotes a reliance upon a supernatural force requires anyone, especially atheists, to do some mental gymnastics to make those statements fit a natural world view. Stating something is not religious in nature, but then following it up with something that is clearly religious is a blatant conflict of reason and is discriminatory in nature to anyone who holds a natrualistic, secular world view and rejects the supernatural. The folks over at the Military Association for Atheists and Freethinkers (MAAF) have posted a more comprehensive report on military “spirituality” at their website, and it includes the actual questions that are on the SFT, including “I am a spiritual person”. We urge you to visit the MAAF’s website and view the full, thirteen page text of the Spiritual Remediation Training. It includes a section on“prayer” and a suggestion that “prayer” is for everyone and need not be religious. According to the MAAF, and agreed upon by all associated organizations, the Army is taking too many liberties in redefining a word. The Army should speficy that prayer is only for religious people and not the same or similar to reflection or meditation. It is the contention of all parties concerned that the Army should abandon the entire spirituality approach. According to the training, everyone is encouraged to seek help from Chaplains. According to the information contained within the Spiritual Remediation Training there is an assertion that chaplains never proselytize, but while there exists several references to various religions, there is no such section that is inclusive of nontheists, even though official DoD demographics (available from MAAF) show there are more Atheists than Jews in the military. Clearly, there exists no demographic justification for overlooking the many members of the United States Army that choose not to believe in the existence of a deity. American Atheists has been a tireless ally on this issue as well, from the beginning. 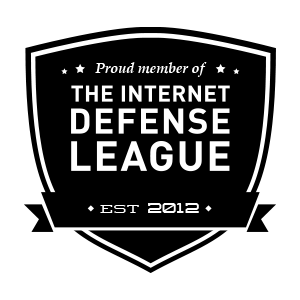 President David Silverman and Vice President / Military Director Kathleen Johnson have been a tremendous support and Kathleen has, on behalf of the American Atheists, sent a letter via Federal Express to the Secretary of the Army alleging the discriminatory nature of the SFT, and has cited AR 600-20 as the reason why its use must be ceased immediately. American Atheists have assured that this is not the end of their involvment, but further action will have to wait until the holidays are over. They have the story up on their website as well and all of us are circulating this story through every means available. It should be noted that Kathleen Johnson is not just the VP of American Atheists, but also the founder of the MAAF and holds the rank of First Seargent (Retired), Department of the Army Civilian, Fort Hood, TX. This issue is far from over. In fact, the fight has just begun and we urge everyone who concerned about the fair treatment of non-believing military personnel and the unfettered right for a soldier in the United States Armed Forces to hold absolutley no belief in anything even remotely supernatural without fear of discrimination or retribution of any kind to follow this story with great interest by visiting and supporting in any way you can the following organizations who are working tirelessly for the equal rights of the men and women who put their lives on the line every day to protect the sanctity of our uniquely secular Constitution, which upholds that there shall be no religious test required to hold any office within the United States Government, and that includes wearing the uniform of any of our Armed Services. Nick Clegg is a Liar and a Turn-Coat! "That's why we are committed to scrapping tuition fees for full and part-time students, and improving access to apprenticeships so that everyone can get the best from their education." Underneath the coalition’s plans, there is an obvious and sickening agenda of drastic social change: not just the brutal cutting of public spending, but a decisive rolling-out of the market-obsessed, “choice”-fixated ideas that took root while Margaret Thatcher was prime minister, were revived and retooled once Tony Blair decided he had to define himself against the Labour party – and now look set to be taken to their logical conclusion by the Tories, and the like-minded Lib Dems who took their party into the coalition. Here lies another reason Wednesday’s events were so significant – for within the government’s plans for higher education lie not just the hiking-up of fees, but an entire reinvention of the very ethos of our universities, whereby the idea of education as a public good takes yet another kicking, and everything becomes down to “choice”, and whatever is meant to be good for ‘business’. On, Wednesday, amidst a dull roar of the 50,000 strong crowd, massed outside, Clegg stumbled through his speech as if he really could not believe what he was saying either. “We have stuck to our ambition? Our wider ambition?”, “Our policy is more progressive?” (Hoots from all sides, including his own.) “The truth is before the election we didn’t know…”. 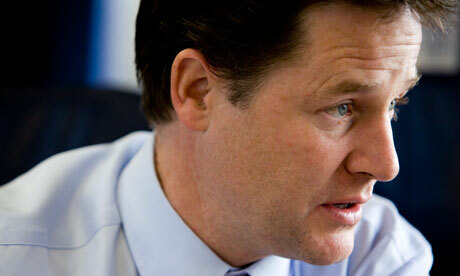 If you did NOT know, Mr Clegg, then why did you make those promises? Answer? To win the student votes! You would have to have been living in a box for two years to not realise the economic condition of this country, (and those who believed him and voted for it must have been with him) but to then march in with this piece of blatant social engineering is unforgivable. Clegg also seemed to accuse some of his Lib Dem colleagues of having their heads in the sand in relation to tuition fees. This will result in University education again ending up, a right to the privileged and prohibitively expensive to those from all but the wealthiest households. This is certainly not a liberal move, and I should NOT have to point out (but I will) that countries in which the poorest are kept in their places by depriving them of education at any level either through cost or legislation, rarely thrive or are able to compete in the world market. How can anybody defend gathering the votes of millions of people on a clear mandate of opposing these Tory proposals, and then – as soon as the door of power opens in your direction – championing each one of them? How can we defend that same outright opposition being forgotten in favour of adopting their position of Lap-dog/whipping boy? This is hypocrisy to say the least. Clegg enabled David Cameron, who got only 36% percent of the vote in Britain, to take the lead in Parliament, and even that percentage was on a promise that “we’re not talking about swinging cuts.”. Some 60% of us voted AGAINST the conservative party. (Is this some form of sick revenge?) During his campaign, Clegg promised he would “prioritise the interests of the poor.” His agreement on these cuts will mean that the poor will not only be losing their job, but their homes too. I wanted to believe in him at first but I am now very glad that I stuck by my instincts because I could see what would happen if either got in. I do not feel betrayed but please allow me to feel indignant on behalf of those who do as we are ALL now stuck with both of them. The report into higher education by the former chief executive of BP (says it all) was hailed by the government as setting its “strategic direction“, and thereby opened the way for the lifting of the cap on tuition fees so that Universities can charge what they like, and much more besides. A recent YouGov survey commissioned by the Sun found that the public opposed the Browne proposals by 45% to 37%; and an ICM poll from around the same time offered the choice between raised fees and the far fairer option of a graduate tax, and found that people favoured the latter over the former by 61% to 29%. While the population meekly accept the ‘need for austerity’, Ipsos Mori found that 59% of people agreed that there was “a need to cut public spending on public services” – the kind of statistic cited almost daily by those newspapers who, DO affect public opinion, by habitually encouraging the government to cut further, and faster. “And what really matters? Thousands and thousands of families in just a few months facing debt, stress, eviction and homelessness. The events at the protest is what turned it into a riot. Throwing fire extinguishers off a tall building could kill somebody, and whatever thug did it should go to prison but most acted eloquently and passionately and peacefully. Cameron complained that there were not enough police at the protest – but he is in the process of dramatically cutting police numbers (he’s a hypocrite too, but that’s another post). Boris Johnson, the Conservative mayor, angrily condemned student violence – hoping we have forgotten that when he was a student, he and the Prime Minister were part of a gang of aristocrats called the Bullingdon Club. It’s illegal to damage property regardless of whether you can afford to pay for it. Decent people call it vandalism and the fact the Bullingdon Club knew they could get away with being louts because they had money makes it worse. They did it because they were rich louts, not because they believed in anything (other than the power their money afforded them). They had no frustration or anger, they just felt like destroying things. The same way that they’re destroying the country now: because they feel like it. The damage the protesters did is irrelevant compared with the thousands of lives the Tories are taking pleasure from destroying and a party whose members cheer at the announcement of 500,000 job losses does not deserve it’s position. They have consistently wept crocodile tears, turning moist-eyed and saying it was “immoral” to “burden the next generation with higher debts.” So, why, as a solution they have introduced a program that definitely will while conspicuously ignoring the glaringly obvious hypocrisy of gaping tax loopholes which allow the already wealthy to avoid paying their share and profit further from this carnage? Why are they not demanding the banks pay back the money they were loaned? Because they really don’t care, that’s why and it was extremely foolish to trust these toffs (who believe bankers deserve a nice fat reward for clearing up their own mess) with our welfare. People who kick others while they are already down, do not care about their well-being. Clegg told Daybreak: “I should have been more careful perhaps in signing that pledge. It was the greatest Liberal of the twentieth century, John Maynard Keynes, who explained definitively why this thinking (put a hold on everything including measures to boost economy) is wrong and in fact caused the Great Depression of the 1930s. While we slip closer to another, we see Ireland is collapsing deeper and harder into depression because it did cut in this way and killed its economy. The coalition is either doing this out of incompetence or they are trying to effect social and severe changes. I fear it is a little of both. If we are “bust” now, we have almost always been bust. Since 1750, our national debt has always been higher than it is now, except for two 40-year gaps. The debt was more than twice this level in 1945, and we still built the NHS and secured decades of prosperity. Johann Hari was the only journalist before the election who warned this would happen but David Cameron called it “black propaganda”, and snapped at a single mum who tried to challenge him about it at a public meeting that she should “run for office yourself” if she was so bothered. Also, spare me the insincere sophistry of Mr Duncan Smith, who’s millionaire lifestyle and his odd ‘kind’ gesture seems to mask his true nature about as well as a Venus fly trap. Can people stop looking up to money please? It’s pathetic and it doesn’t produce better people, just richer ones. Smith’s evil decisions, evident lack of compassion, and painful ignorance of the facts is triggering now an exodus of poor people from their communities. It will force them to move away from their low-paid jobs in our great cities, and to move into concrete blocks of poverty in cheap-areas with pre-existing unemployment problems. Housing is only cheap where there are no jobs! I am interested to know how Mr Smith believes his decisions will improve anything? All it will do is force people into poorer areas, lead to overcrowding, and force them to commute long distances at great personal cost to keep their jobs negating any saving they make on their accommodation. For a generation now, we have been whittling down our stock of council housing mostly under the Tories but under New Labour too. They were sold off, which was a good policy because it expanded home ownership but instead of investing the proceeds in building more council homes and affordable housing, they were frittered away on tax cuts for the wealthy. The only viable and fair option now is to reinstate a program of house building, which would in turn generate employment but instead Con-Dem coalition has decided to cut house building to its lowest level in generations and stage mass evictions. Clegg and his party were left under no illusion about the level of fury felt at the party’s U-turn as the National Union of Students (NUS) warned students would attempt to oust Lib Dem MPs who vote for a tuition fee hike by trying to force a by-election under proposed recall legislation in the constituencies of MPs who renege on a flagship manifesto promise to oppose any hike. Today, the deputy PM defended the U-turn and insisted that the government’s policy would help generations of poor people go to university. I wonder how, when families stand to lose their homes stand to lose their homes and much-needed help? The coalition’s cuts are barbaric and divisive. As the population increases, and lives longer, our housing crisis will only increase and divide us further. A one bedroom flat in London will fetch between £190k to £300! This is a ridiculous price and it is therefore no wonder that so many need Housing benefit for rented properties. It is beyond me why people had have skirted around the fact that most property is over priced and over valued by estate agents eager to make huge sales commissions and seller’s rates. The applicants of Housing Benefit do not receive that money, the landlords which charge it do. These landlords will charge up to the cap because they can, regardless of the standard of the property so the cost of housing has been artificially inflated (29% of new housing projects were deemed unfit for habitation AND we have NO room size standards in England and Wales.) by people making a living off investment buying and landlords charging whatever they think they can get away with. How about placing maximum rates that people can charge for certain size properties to stop people from being held to ransom over exorbitant accommodation prices? In the debate led by Baroness Hollis, demonstrated also that landlords are not compelled to accept tenants who rely on this benefit and only a tiny percentage do. There are at least 5 or six applicants for each of the properties that are available. 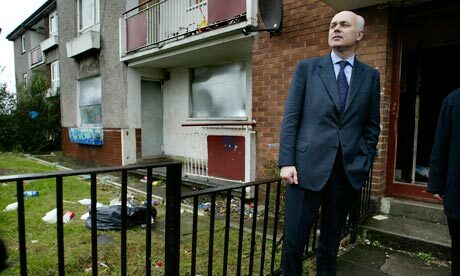 Iain Duncan Smith sneers at the view from a low standard housing block. Sorry it fails to meet your standards, but not all of us can afford to run million pound mansions but then YOU inherited that. As Patrick Wintour and Randeep Ramesh report in the Guardian today, the proposals will include tough sanctions on Job-seeker’s allowance and those who refuse to work: these sanctions already exist. It is understandable why people become disenchanted when employers do not even acknowledge that they have even received the application let alone, if the post has been filled or why they were not right for the job. I do think it should be a legal requirement to reply to applications, seeing as simple courtesy seems to be viewed as optional extra these days. An application response letter would also add proof to the Job-seeker’s efforts in finding a job by giving them something to work on from even if it is only the reassuring thought that they have not been ignored. So Mr Cameron, Mr Clegg, it’s okay to destroy the lives of the thousands that you DON’T know, as long as the people that you DO know and share your politics (in your party) don’t get hurt by the desperation driven backlash. Nick Clegg finished his speech with a lavish tribute to Iain Duncan Smith. “He deserves enormous credit for the policy we are putting forward today,” Clegg said. Duncan Smith has “unrivalled expertise” in this area. Merely passing the buck or more telling that it seems? 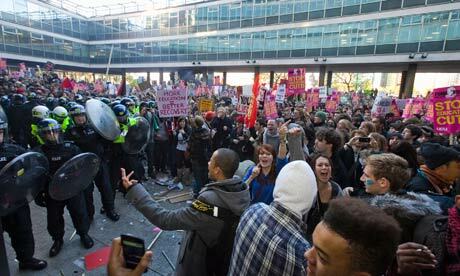 Students face police at Millbank tower, London, during the protest against tuition fees. We now know what’s coming: the deepest and quickest reductions in public spending since the 1920s – which, according to an under-reported quote from David Cameron, will not be reversed, even when (they wont) our economic circumstances improve. Clegg, Cameron and other ministers get are dangerously close to reviving the nasty old trope of the ‘undeserving poor’. As if to try to neutralise recent fretful noises from the Archbishop of Canterbury, Iain Duncan Smith talked about worklessness being a supposedly self-imposed “sin” (Does he know everyone’s circumstances then?). Changes to housing benefit alone will detrimentally change this country for decades. These moves will lead to, poverty, homelessness and yet more riots. Wiping out another generation’s skills and abilities and limiting education to only those that can afford it is a recipe for regression. Only an idiot that thinks the Tories care about the middle-class any more than they do of the working-class and when the Tories have nothing left to kick and take from the working classes to support the rich and clear up the mess left by the banks, the middle will be the next target. It is inane to blame all ‘Labourites’ (I hate that phrase. Particularly as it includes the supporters of the party who have no part in policy making.) for the misdirection suffered under the New Labour experiment. It has been a failed experiment in some ways, many ways, but that does not mean for a nano second that we cannot regroup, and establish a better set of values that are more akin to the old Labour ones.